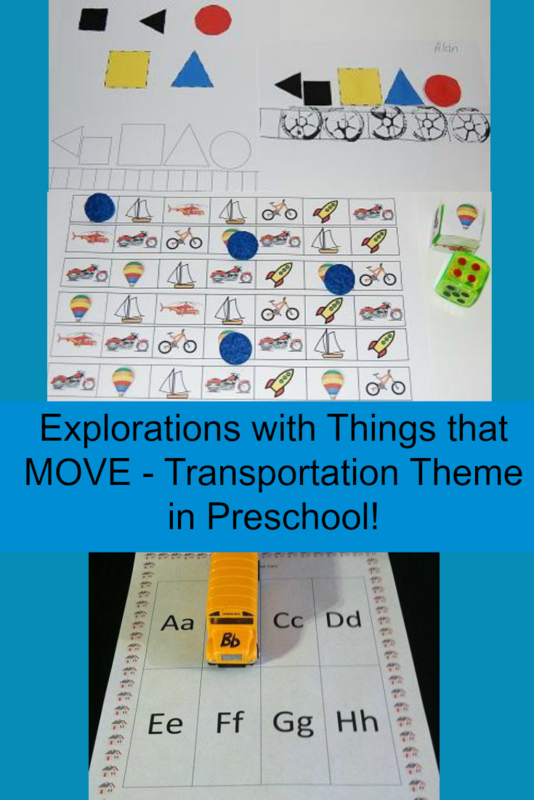 Come Explore THINGS THAT MOVE with FUN Transportation Theme Activities for Preschool! Children love to play with and learn about transportation vehicles! The activities below will keep your children engaged in learning while having FUN with a Transportation Theme! To help introduce Transportation Vehicles to the children, give the children old magazines to cut or tear out pages with different vehicles on them. Make a transportation poster and label each vehicle the children find. Extension: classify the different vehicles into groups according to how they travel (air, land, or water). One Build a Shape Train file per child (linked above). Print the file linked above for each of the children. Have the children cut out the colored shapes and match them to the corresponding shapes in the train. If desired, the children can make the train wheels by using empty thread spools as painting tools. Place a little black tempera paint on a plate and let the children make wheel prints on the train tracks! 1 die with pictures of vehicles (pictures included in the file linked above) glued or taped on. Print the file linked above (laminate for durability, if desired). Cut out the transportation vehicle pictures and adhere to one die. Invite one child roll both of the dice (the vehicle picture die and the number die). The child can then place counters/chips on the transportation mat to mark off the same number of vehicles as they rolled. For example: if the child rolls a “2” and the “motorcycle,” then 2 counters would be placed on the motorcycles on the transportation mat (see example pictured above). Play continues until either one type of vehicle is completely covered, one row is covered, or until the children are able to cover the entire transportation mat. **This game can be played individually, with partners, or in small groups. Print the file linked above and laminate for durability. Label small plastic transportation vehicles with uppercase letters, lowercase letters, or any numbers your children are working on (dry erase markers will wipe off easily on metal vehicles once the activity is over). Randomly place all the lettered or numbered vehicles into baskets or bins. 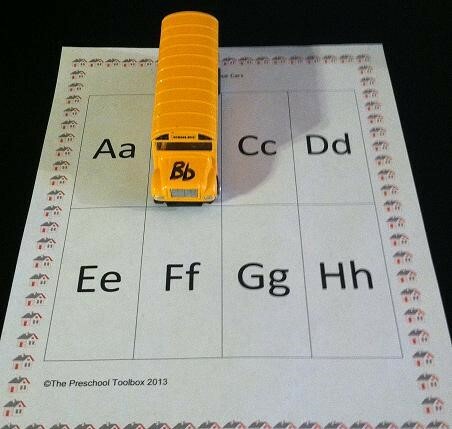 Tape the file pages (parking spots) onto the floor or tables in different areas of the classroom (or at home). Preschoolers must pick a vehicle and locate the corresponding “parking space.” The children can leave the vehicles “parked” until all the lettered or numbered spaces have been filled (see photo above). **There are blank spaces at the end of the file to add different numbers your children might be working on. 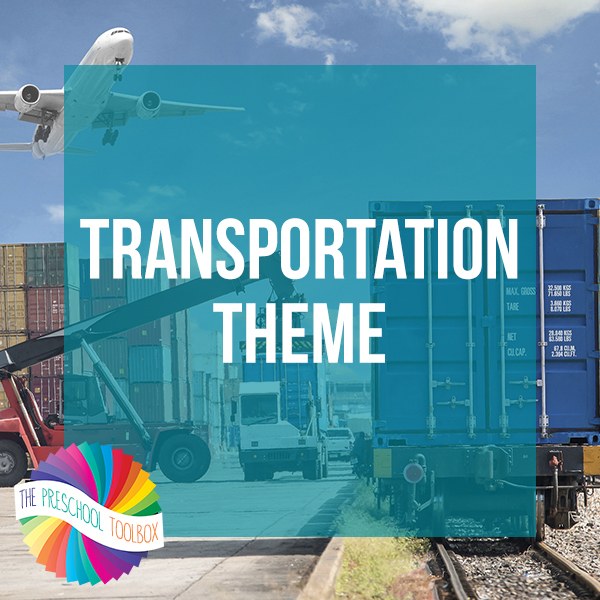 For more Transportation Theme Activities, see the Transportation Thematic Unit at The Preschool Toolbox Blog! « Ice Cream-Themed Summer MATH Activities for Preschoolers!